STOCKHOLM — Chick peas, fava beans and other seeds from a facility in Syria are among the 25,000 new samples being deposited this week in an Arctic seed vault built to protect food crops from wars and natural disasters, officials said Tuesday. The latest additions mean that the Svalbard Global Seed Vault — a master backup to the world’s other seed banks — has now secured more than 740,000 samples since it opened in a remote Norwegian archipelago in 2008. That represents an estimated three-quarters of the biological diversity of the world’s major food crops, said Cary Fowler, executive director of the Global Crop Diversity Trust, which maintains the vault with Norway’s government and the Nordic Genetic Resources Center. “I think the events unfolding in Syria obviously underline the importance of having safety duplication outside of a country,” he said, adding the facility had not been damaged in the military crackdown on an anti-government uprising. He noted that wars destroyed seed banks in Iraq and Afghanistan. Another one in Egypt was looted during last year’s uprising. 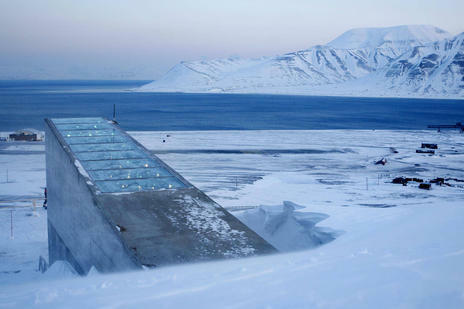 The Svalbard Global Seed Vault — sometimes referred to as a doomsday vault — is designed to withstand global warming, earthquakes and even nuclear strikes. Samples shipped this year also included wheat from a range of climates and conditions in Armenia and the Pamir mountains of Tajikistan — the first seeds from the two former Soviet republics. Wild crops — ancient relatives of domesticated crops — are of particular interest because of their resilience to harsh climatic conditions.